Where shall I begin with my love and hate relationship with Lubia Polow? First and foremost, it is one of my most favorite Polows. The first time I ever attempted to make Lubia Polow it was an epic, and I mean EPIC disaster. Then I went on strike and never made it for another 12 years….a little dramatic, I know…the irony is that when I made it again, it was nothing to write home about. The thing that got me both times, I realized later, that my rice had turned all mushy because of the juices from the green beans and meat. Last week I gave it another try. I was finally happier with the results. The Sous Chef was all over it and I had to literally pack it up and take it away so that I could give some to Sheila before he ate it all! Small dice onion and crush each garlic and remove skin. Sauté in oil until translucent. Add turmeric and cinnamon and cook for a few minutes longer. Cut the meat in small cubes. Add meat to the onion. Season with salt and pepper. Sear meat until brown. Add 1 cup of water along with the tomato juice from the can to of diced tomatoes. Cover and cook for 1 hour. In the mean time sauté green beans in oil for a few minutes. 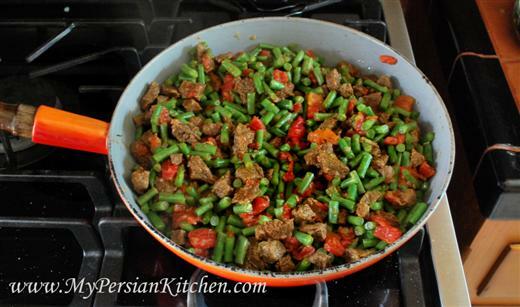 Add meat only to the green beans. Take 1/2 cup of the meat juice and add tomato paste and mix well. Add to the green beans and meat. Season with salt and pepper and cook uncovered until the juices have evaporated and the green beans are almost cooked. Par-boil rice as demonstrated on Cooking Rice for Polow post. 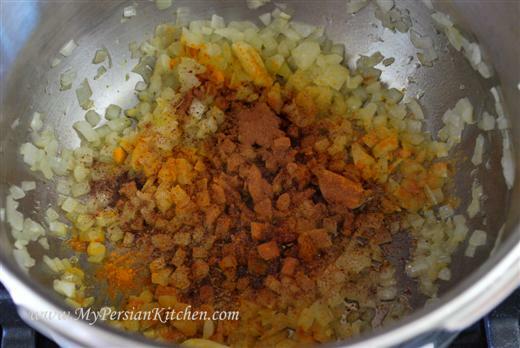 Add 2 tablespoons of canola oil, 2 tablespoons of water, and 1 tablespoon of brewed saffron to the bottom of a non-stick pot. Shake the pot. Add a layer of rice. Cover with a layer of the green beans and tomato mixtures. Sprinkle some advieh on top. Repeat layering until both rice and green beans and meat mixture are gone always ending with a layer of white rice. Be sure to add advieh as you go. Mix 2 tablespoons of brewed saffron with 2 tablespoons of canola oil and pour over rice. Wrap lid in a towel, cover the pot and cook on low for 1 hour. Lubia Polow is often eaten with plain yogurt of Mast-o-khiar. Small dice onion and crush each garlic and remove skin. Sauté in oil until translucent. Add turmeric and cinnamon and cook for a few minutes longer. Cut the meat in small cubes. Add meat to the onion. Season with salt and pepper. Sear meat until brown. Add 1 cup of water along with the tomato juice from the can to of diced tomatoes. Cover and cook for 1 hour. In the mean time sauté green beans in oil for a few minutes. Add drained diced tomatoes. Add meat only to the green beans. Take 1/2 cup of the meat juice and add tomato paste and mix well. Add to the green beans and meat. Season with salt and pepper and cook uncovered until the juices have evaporated and the green beans are almost cooked. 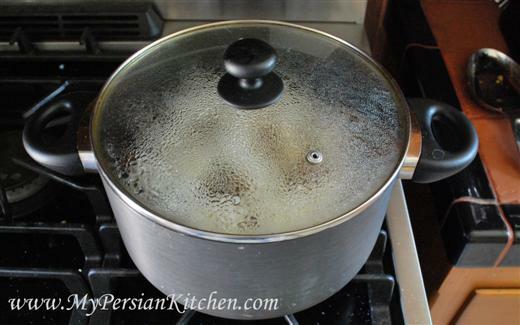 Add 2 tablespoons of canola oil, 2 tablespoons of water, and 1 tablespoon of brewed saffron to the bottom of a non-stick pot. Shake the pot. Add a layer of rice. 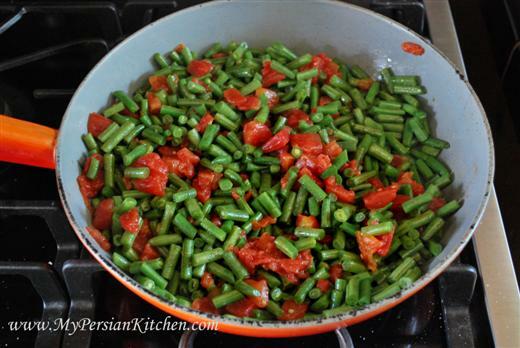 Cover with a layer of the green beans and tomato mixtures. Sprinkle some advieh on top. Repeat layering until both rice and green beans and meat mixture are gone always ending with a layer of white rice. Be sure to add advieh as you go. Cover rice and cook on high for 10 minutes. Mix 2 tablespoons of brewed saffron with 2 tablespoons of canola oil and pour over rice. Wrap lid in a towel, cover the pot and cook on low for 1 hour. This was seriously some of the best rice I’ve ever eaten … it disappeared faster than I’d like to admit!!!! Sheila, so glad you liked it! I was able to get this one to you before *someone* got to it!!! Yum!!! the lubia Polow looks Delicious~thank you for the reicpe!!! Thank you for posting this recipe! So helpful, especially for those (*ahem* me) who have a hard time getting precise recipes from their Persian mother! For the pesca-tarian / vegetarian bunch, this dish is also delicious with sautéed mushrooms instead of beef. This looks fantastic and I don’t think I could boycott it for 12 years like you. hehe. 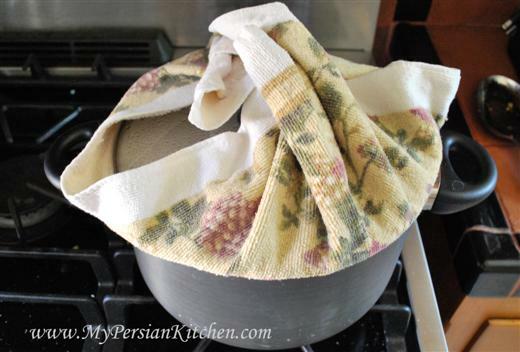 I use the same method with the towel for cooking rice, it gives the best results. @ Sara, you are welcome! @ Omid, I hear ya about precise recipes! You know you kinda read my mind. I think this would actually be a delicious vegetarian or vegan dish without the meat. @ Nadia, well I boycotted making it for 12 years, but NOT eating it when other people made it!!!! 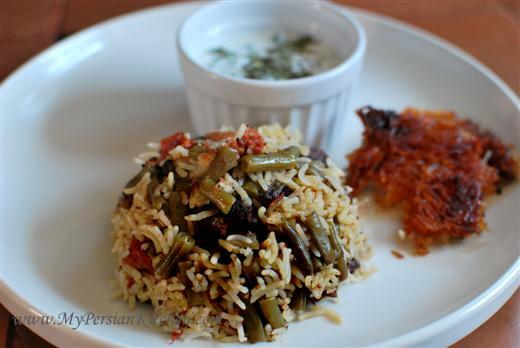 This was one of my favorite Persian dishes! Oh, don’t we all have those dishes that we boycott after a disaster? For me, it’s custards. I find those sooooo hard to make right. I’m glad the boycott has been lifted. . .this looks excellent. This is one of my favorite dishes too. I am going to have to try this one for myself. I have to say Persian food intimidates me. Mostly because my friend cooked a lot of it in a pressure cooker and my mom had told me stories about having the pressure cooker explode on her when she was growing up. I’m one of those people that if its going to happen to anyone it will be me. @ OysterCulture, funny how you brought up pressure cooker. I just bought one and I am testing it out. My grandma used one all the time and my mom likes using hers too. I just resisted getting one for a long time. I am actually pretty impressed with the locking system to ensure that the lid won’t fly open. I am actually going to post about my experience with pressure cooker next week! @ Kim, great idea to make it with chicken! Made this last night and yum, it was delicious! The beans could have been a tiny bit more well done, but otherwise I didn’t have any complaints. Thanks so much for posting this recipe with such precise directions. It definitely helped in making this dish, which I found to be one of the more intricate/complicated ones I’ve attempted. Cassie, awesome! I would definitely agree with it being intricate/complicated. As you make it more you will get a better feel of it! 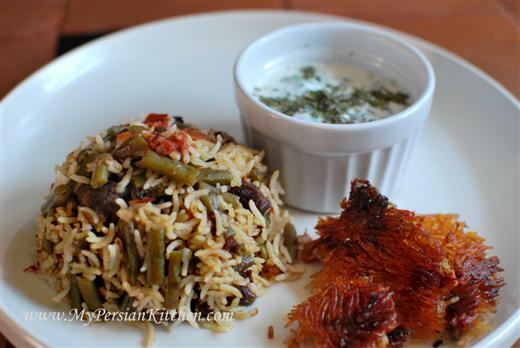 This is my husband’s favorite meal and my mother only made the khoresht, not the pollo! It took me several times to get it right. And if you don’t pay attention, it can turn into a soggy mess. And the funny thing, everyone has a different technique! I’m glad I found your site. I’m looking forward to comparing our different recipes! Just discovered this variation to a family classic. Now I know how to prevent the soggy rice I kept getting. Easy solution. I will try with the tumeric. We keep our strictly to cinnamon. A Persian friend of mine taught me how to make this dish. It is addictive, particularly with a good basmati rice. I noticed you ask for stewing meat in all of your polow recipes. What cut of meat is considered stewing meat? I am sorry if the question is too naive. I just never make much stew and simply don’t know what to ask for at the grocery store. 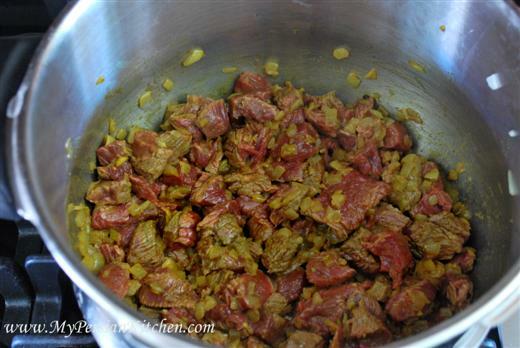 I tried kind of a polow recipe recently with boneless pieces of lamb shoulder. The meat tasted slightly fibrous and I was left wondering if I need to pick a different cut or kind. TD, just check the meat section at your supermarket for packages of meat cut in cubes. 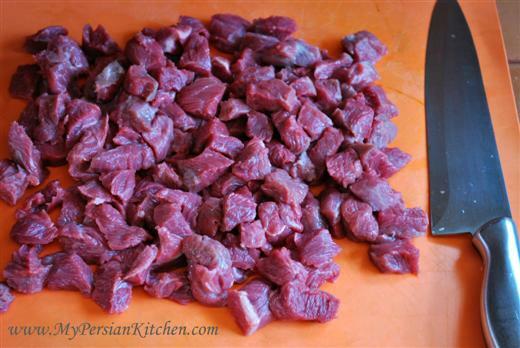 If you go to Persian stores they simply have a sign saying stewing meat. These are generally a bit tougher cuts of meat that you have to cook for a little while. If you don’t see it, then simply ask your butcher for it. Very delicious. And i add 1 tbsp of curry powder and the taste was wonderful. 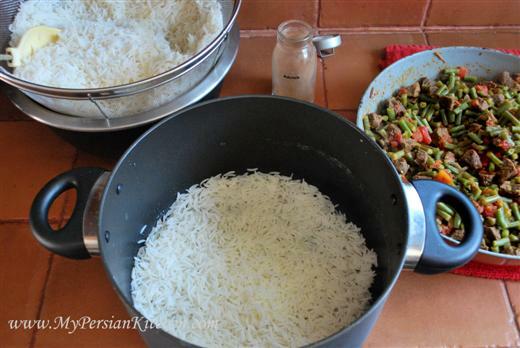 thank to “my persian kitchen” for the lovely recipe. i really love your website! Sorry, I may have missed this part of the recipe but how much uncooked rice do you use for this recipe? Thanks so much. It looks delicious and can’t wait to try it out, but just want to make sure my measurements are correct. Sanaz, thanks for pointing it out to me. I updated the recipe! I have your recipe on the stove right now, with ground beef instead of stew meat. Seems like it is going to be delicious! Seg, it’s kind of hard to make it fast. 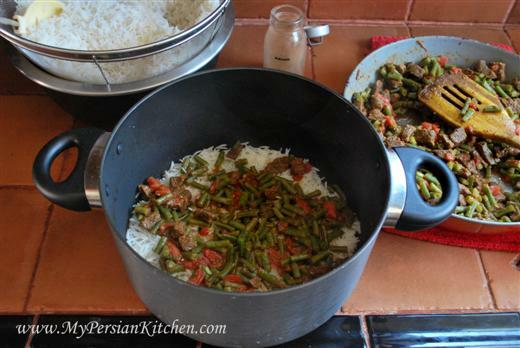 Maybe you could make the meat and green beans the day before and then the rice on the day that it needs to be made…. When I first prepared this delicious dish for my Shiraz-born-and-raised husband, I think that he fell in love with me all over again. This recipe is definitely a keeper! 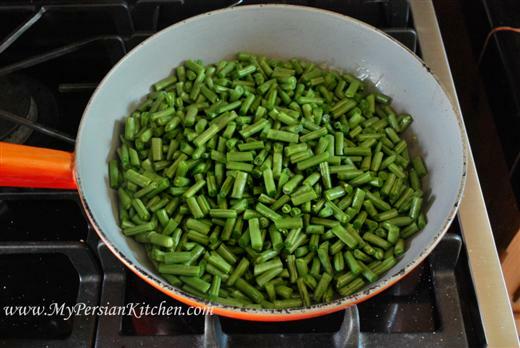 I love to make Lubia Polow especially in early summer, when locally-grown green beans are inexpensive and everywhere here in southern Texas. Since I don’t have his family to consult about his favorite Persian cuisine, I’ve had to discover what my husband loves to eat largely through trial and error. Your site is my favorite reference when I want to prepare comfort foods from his childhood. Some dishes he loves. Some aren’t his favorites. Nevertheless, all of your recipes are excellent. I especially appreciate your commentary about the personal and cultural significance of certain foods. That helps fill in the blanks about Persian folks’ relationship with food, which helps me understand my husband better. Thanks! Great recipe. Can this be made with any sort of fowl, like chicken or turkey? Jack, yes you can substitute with any type of meat you like. Excellent recipe! What a great site. I am Anglo-Indian and my husband is Iranian and I have collated a few recipes from his whole family over the years. But your lubiya pollow and Kalam pollow recipes are a huge hit with the whole family I plan to work my way through the site experimenting. Thank you! !